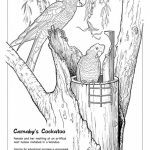 The activity sheets that are available from this page are companions to the Exploring Perth’s Banksia Bushland activity sheet released by Hon. 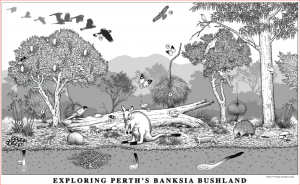 Dr Sally Talbot at the Perth’s Banksia Woodlands symposium in March 2011. 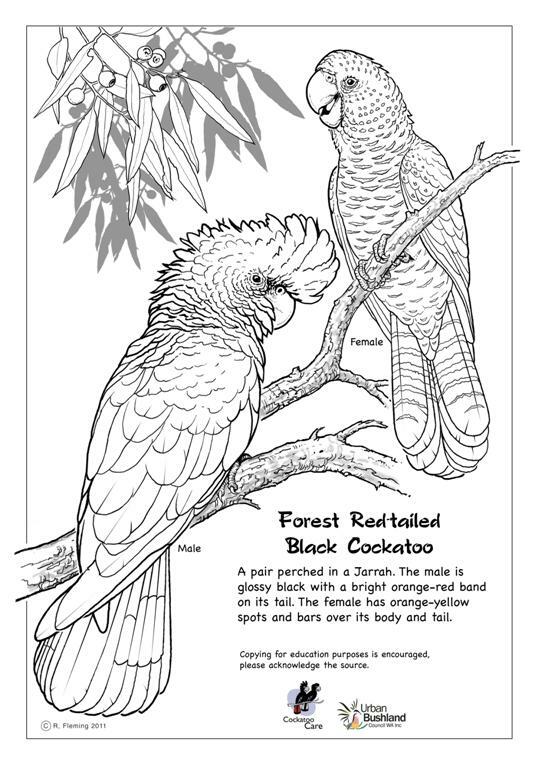 The three species of black cockatoos seen in the Perth area are all endemic to south-west WA and their very existence is threatened due to destruction of forest and woodland habitat having an impact on food resources and hollow-bearing trees for nests. 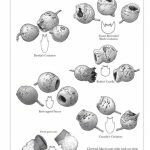 Other threats to the birds are competition for breeding hollows by other species, feral European honey bees, poaching of eggs for aviary trade, changes in fire regimes and potentially climate change. 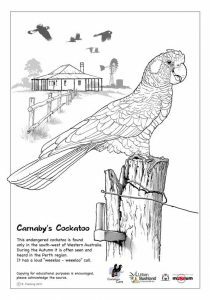 The activity sheets have been designed for a wide audience – from simply as a colouring sheet for lower primary school children to a sheet that requires more research by upper primary children into colours and textures etc. of the birds and surrounding vegetation. 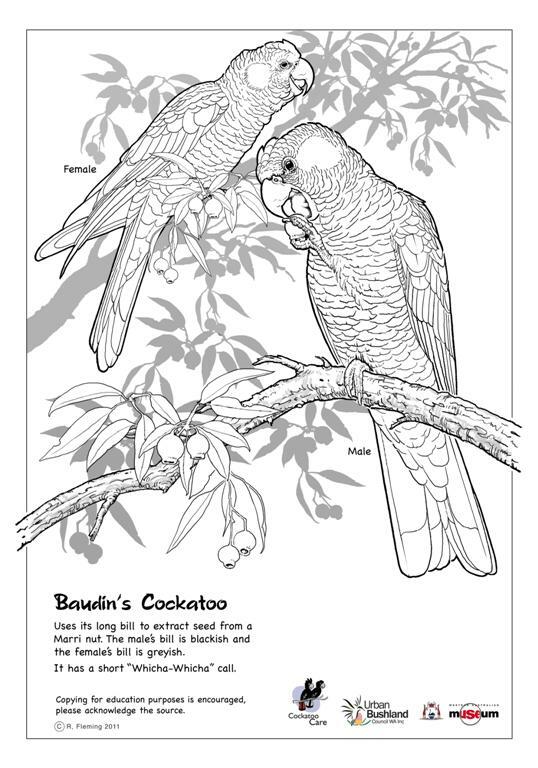 For upper primary, secondary school and others, the rear of the sheet has facts in a condensed form about each of the species. Download the full set of notes here: (Download). Forest Red-Tailed Black Cockatoo. (Download). 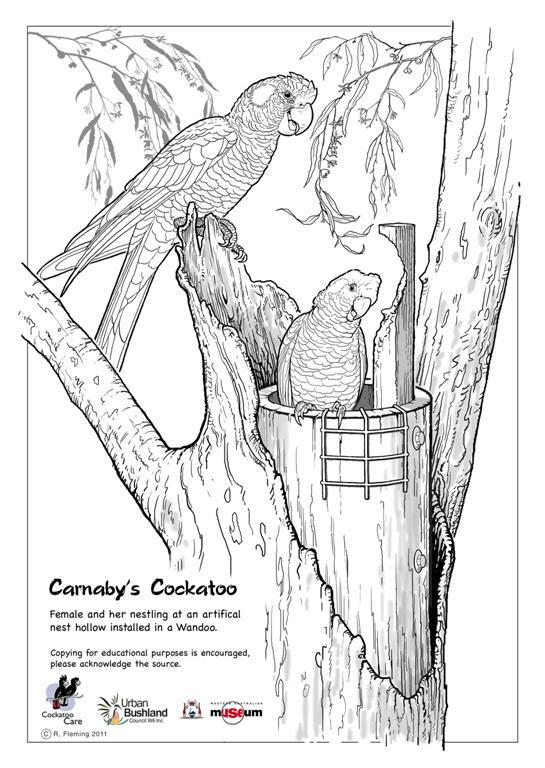 Carnaby’s Cockatoo with nestling at a nest box. (Download). 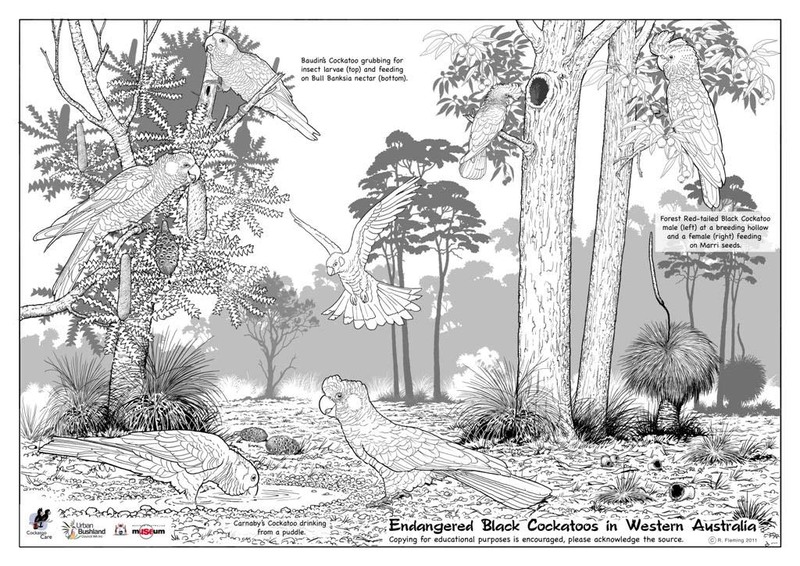 Three species in bushland setting. Download). 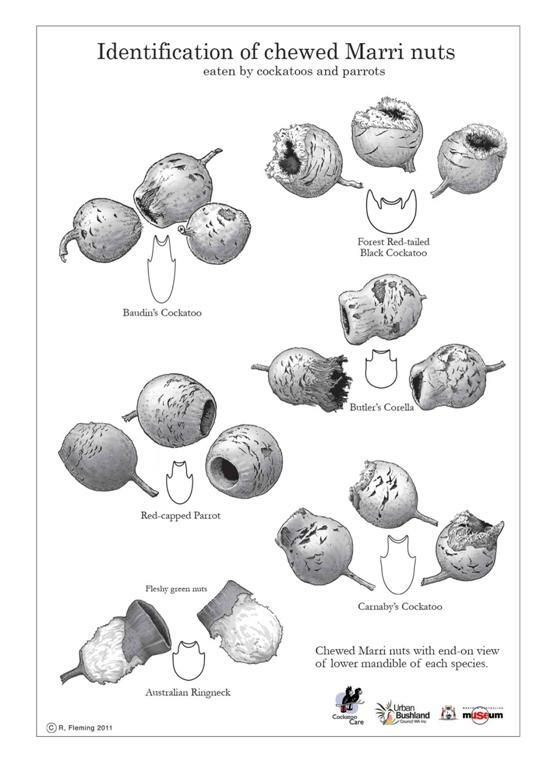 Identification guide to Chewed Marri nuts eaten by cockatoos and parrots. (Download). Artwork. 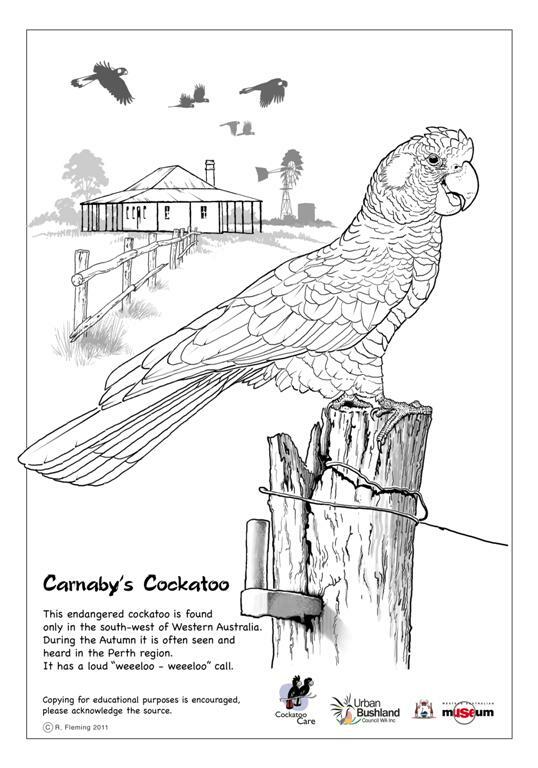 Carnaby’s Cockatoo at Nestbox. Artwork. 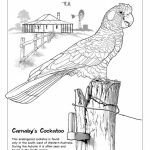 Three Cockatoo species together. Artwork. Chewed Marri nut identification. 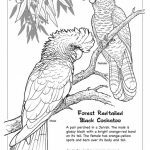 An activity sheet designed to support students learning about the Banksia woodlands of Western Australia has been developed by members of the Urban Bushland Council. 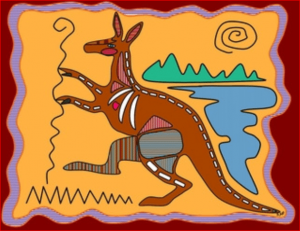 Lesson plans, suitable for primary school age children, are provided in this section. There are many other ways that the sheet could be used to help in the study of our natural environment. Some further suggestions are included at the bottom of the page. 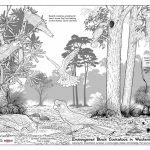 We have created this drawing of banksia woodland to illustrate the diversity of habitat and the interdependence of flora and fauna within it. 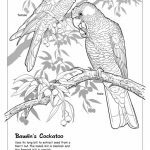 The Banksia Bushland Activity Sheet is designed for A3 Printing. (Download). The lesson plan can be downloaded here. (Download).